I’m sure it’s colder where you are then where I am in Los Angeles but the air out here still has a nip in it most nights! So make sure you adjust your skin care products during these colder months as you want to make sure it has the right level of moisture. Give your skin a one-two punch with two from the LIZ EARLE line. Superskin Concentrate ($70/1.6oz) – is comprised of 100% pure plant oils including argan oil, which is known as the ‘gold of Morocco.’ Use this one under your moisturizer at night on the face, neck and decolletage. Superskin Moisturizer ($60.1.6oz) – contains natural plant oils including cranberry seed oil, which is high in Omega-3, 6 and 9, borage seed oil and rosehip oil. Wow. This duo is a big recommendation. Both @ birchbox.com. 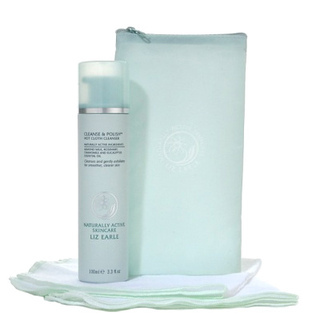 The LIZ EARLE line is being touted as Britain’s best kept secret and if her Cleanse & Polish Hot Cloth Cleanser Starter Kit ($24.50/3.3oz + 2 cloths @ lizearle.com) is any indication of the quality of the line, I’m a believer. I’ve always been a big fan of the washcloth when it comes to cleaning my face. I use a fresh one every night with whichever cleanser I am using at the moment and the fact that this one includes using one as part of the process makes me think they know what’s up. The cleanser is a cream and contains almond milk, rosemary, chamomile, and cocoa butter among others. After working the cream in the skin, work the muslin cloth that you’ve steeped in hot water (make sure you squeezed the water out first) around the face. This is the polishing part of the course and is perfect to help remove all your makeup at the end of the day. And now you’ve cleanser and exfoliated at the same time! After cleaning your face, rinse the cloth in cool water and remove the cleanser. I think because this is a cream, I felt no tightness in my skin after rinsing. And the cloth can be washed in the machine and reused. We love reusable beauty! Just looking around the web to find out more info about the line, I read some of the reviews on hsn.com, and I don’t think I’ve seen such a high rating of customer reviews for a product. This one received a 4.8 out of 5. One user even said this is a really great product if you have sensitive skin so there you go.